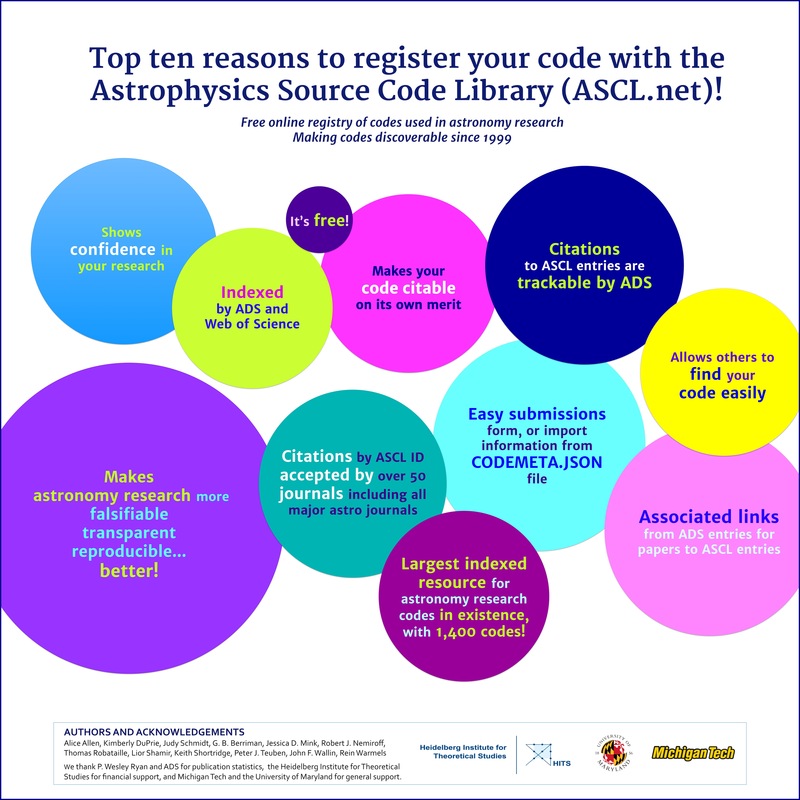 With 1,400 codes, the Astrophysics Source Code Library (ASCL, ascl.net) is the largest indexed resource for codes used in astronomy research in existence. This free online registry was established in 1999, is indexed by Web of Science and ADS, and is citable, with citations to its entries tracked by ADS. Registering your code with the ASCL is easy with our online submissions system. Making your software available for examination shows confidence in your research and makes your research more transparent, reproducible, and falsifiable. ASCL registration allows your software to be cited on its own merits and provides a citation that is trackable and accepted by all astronomy journals and journals such as Science and Nature. Registration also allows others to find your code more easily. This presentation covers the benefits of registering astronomy research software with the ASCL. This entry was posted in AAS, conferences, poster on January 5, 2017 by Alice Allen. Page rendered in 0.393 seconds. Blog powered by WordPress.